Unfortunately, there are many medications that have anxiety and irritability listed under their “possible side effects”. If you are taking these while going through menopause, it is likely that the chance of suffering from irritability and anxiety will be somewhat enhanced. This is due to the fact that the hormonal changes happening in your body will affect the chemicals in your brain, consequently impacting your mood. Being aware of the types of medication that can cause irritability and anxiety can help you make a conscious effort to lessen the chances of suffering from such problems. Continue reading to learn about some of the most common medications that can cause irritability or anxiety. Birth control pills contain artificial hormones that influence the processes in a woman's reproductive system - these are estrogen and progestin. Because of the introduction of these to the body, it is possible for some women to experience mood swings. The chemical activity that occurs can cause your emotions to go up and down. One study carried out in Denmark in 2016 revealed that women who used oral contraception were 23% more likely to suffer from anxiety and irritability episodes. Unfortunately, thyroid problems are fairly common in women; in fact, every one in eight will encounter a thyroid issue in their lifetime. A problem is more likely to develop after menopause, due to the fact that your hormones go through significant fluctuations during these times. The medication prescribed to treat thyroid problems interacts with hormonal activity, and some women find that this can cause them to feel irritable and anxious. There are other medications that interact with hormone levels in the body. Hormone replacement therapy (HRT) is frequently prescribed for those who have intense menopause symptoms. It works by supplementing low hormone levels during menopause to alleviate symptoms caused by low estrogen levels, like hot flashes. Unfortunately, because hormone levels are affected, some people experience irritability and anxiety, among other changes in mood. 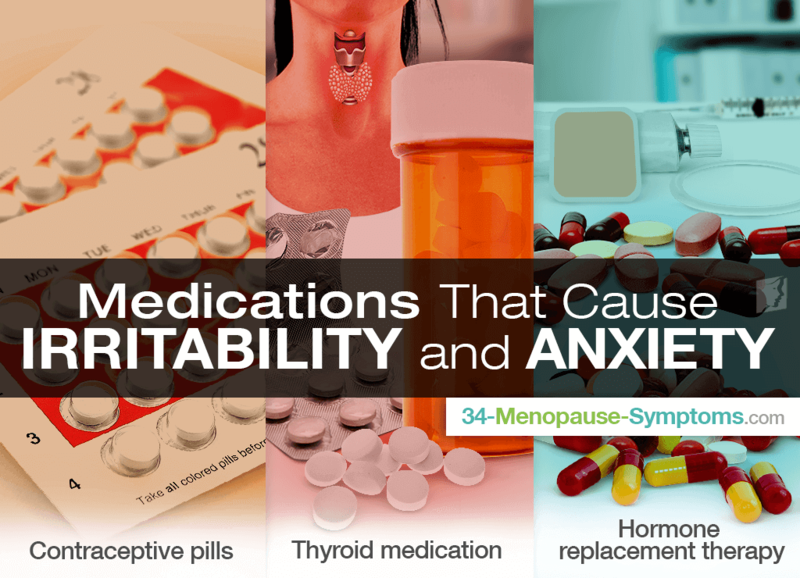 The above are just some of the more well-known medications that are taken by women who may be entering menpause. Many other prescribed drugs and treatments, and sometimes alternative medicines, can have irritability and anxiety among their side effects. It is recommended that after trying some natural remedies or introducing small changes to your day-to-day routine, you should seek advice from your doctor regarding other options for alleviating irritability and anxiety.